Scallops are wonderful, but scallops in a brown butter breadcrumb sauce? Heaven. Try this recipe for brown butter scallops with crispy breadcrumbs soon! So easy and so scrumptious. Scallops are one of the Southern husband’s favorites. As for me, they are way behind a whole bunch of their seafood compatriots, including shrimp, tuna, mussels and of course lobster. So the Southern husband doesn’t get scallops as often as I’m sure he would like to…until now. Because as it turns out, when you cook scallops in browned butter and serve them with bread crumbs that have been baked with a little olive oil and white wine, they vault right to the top of the seafood charts! First of all, we need to discuss wet sea scallops and dry sea scallops. (Sea scallops are the big ones, not the tiny little bay scallops, and sea scallops are what you want for this recipe.) Wet scallops are scallops that are shucked and placed into cold water, sometimes with preservatives to make them last longer. They tend to be a little tougher, and they lose some of that lovely seafood flavor, but they last longer which is why they are treated this way. Dry scallops are exactly that – scallops that are shucked and placed into a container with no water and no preservatives. They don’t last as long, but they have a nicer taste and consistency. (Click here for a more detailed description from my friends at The Kitchn.) I always opt for dry scallops if they are available, but you have to ask, otherwise you don’t know which ones you are getting since they look exactly alike. And that is your scallop lesson for today! Scallops are wonderful, but scallops in a brown butter breadcrumb sauce? Heaven. 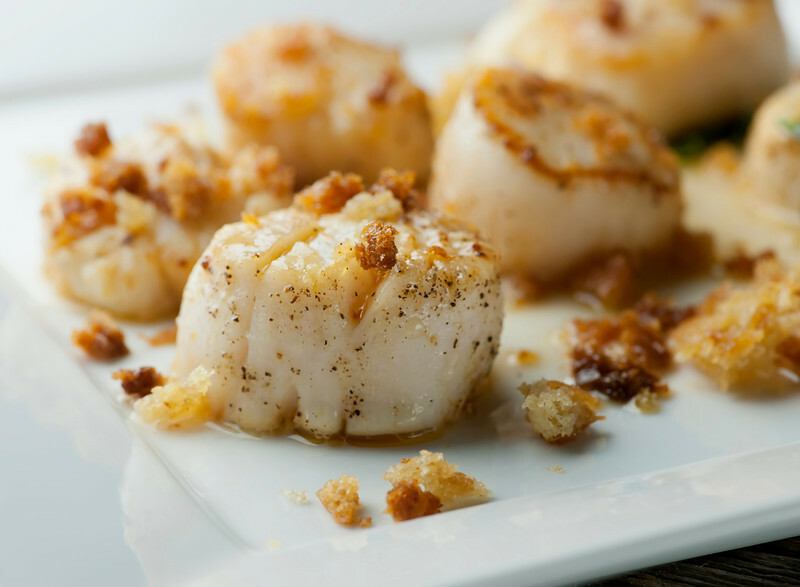 Try this recipe for brown butter scallops with crispy breadcrumbs soon! So easy and so scrumptious.Click to TweetMeantime, this recipe is about as easy and elegant as it gets (I love it when those two things go together!). You want to start by making the bread crumbs, since the scallops are going to take a grand total of about 5 minutes to cook. Whirl a couple of slices of bread in your food processor, mix them with a little melted butter and white wine (don’t worry if they look mushy) and bake them for about 10 minutes until they are golden and crispy. Now, season up your scallops with some salt and pepper and cook them in some olive oil until they are brown. Flip them over and add in the butter, stirring the butter around gently until it melts – make sure you get some of that nice melted butter over the top of your scallops. Cook the butter and scallops just until the butter turns brown, which should only take about 2-3 minutes. Now all that’s left to do is pop those scallops on warm plates, drizzle the brown butter from the pan over them, and scatter on some bread crumbs. I like a little squeeze of lemon or lime juice to brighten everything up, but that’s totally optional. I served this with some fresh green beans on the side, but you could also serve them over rice and that would be scrumptious too. Or both! Put bread slices in food processor and process until you have breadcrumbs. Mix crumbs with melted butter and white wine (don’t worry if it looks mushy) and spread in a single layer on a rimmed baking sheet. Bake until golden and crispy, about 10 minutes. When crumbs are done, make scallops. Heat olive oil in a large skillet over medium high heat and season both sides of scallops with a little salt and pepper. Add scallops to skillet and sear on one side for about 3 minutes. Don’t move them once they are in the pan to get a nice firm sear. Turn the scallops over (tongs work best for this) and add the sliced cold butter. Stir the butter around and dribble some of it over the scallops. Do this for about 2-3 minutes until the butter turns brown. Divide the scallops among warmed plates, drizzle the butter from the skillet over the top and scatter generously with breadcrumbs. I absolutely ADORE scallops. Love ’em! I love them seared, just like this. This is embarrassing, but I was recently diagnosed with gout. Yes, gout. (Thanks, Dad). I’m hoping it’s a one-time thing, because scallops are listed as a trigger food. This cannot be! These look perfect. Brown butter truly does magical things to just about anything. It does!! Mashed potatoes and brown butter? Heaven. Just love your site!! Thank you for the wonderful recipes that even I could do!